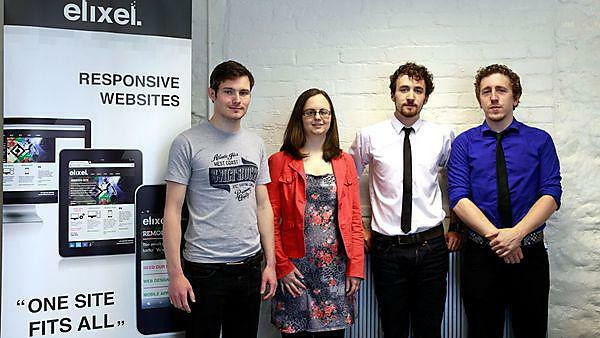 Elixel is a Plymouth-based digital creative agency set up by four graduates from digital art and technology: Paul Bird, Gavin Jones, Christian Cook and Becky Veater. After graduation, rather than going through the process of applying for jobs in other people's companies, they decided to set up their own. Elixel was kickstarted into life after winning £10,000 investment funding and a package of business support from Creative England, as part of the 'Starter for 10' competition. Since then, Elixel have been successfully developing responsive website design, mobile apps and branding materials for a wide range of clients from both industry and academia. "Without the teaching at Plymouth University, Elixel just wouldn’t exist. Not only do they strive to teach new and emerging technologies, they encourage students to be entrepreneurial and think big. This, along with access to a placement year in the industry, helped us to gain the knowledge and connections we needed to be able to run a successful business in the digital sector. Plymouth University is all about enterprise, innovation and exploration, so it’s more than just learning the basics. Studying here means developing an understanding of a range of technologies. From HTML5 and PHP, to immersive environments and Kinect and Arduino installations, the diversity of teaching opens the mind to new and exciting ideas for the future." Real industry experience is a highly valuable thing moving forward after university, and it can have a positive long term effect on your career.